‘Where is home?’ is a question I find very difficult to answer. My father came from Croydon and my mother from Leicester, but I was born in a very small village in Sussex called Cross-in-Hand. My grandfather, my mother’s father, known as Captain Raymond Tyler, had inherited Tyler’s boot and shoe factory in Leicester. He and his brother and sister sold it off when they were in their twenties and lived on the proceeds. I remember the rather grand house in Cross-in-Hand which had a name ‘Clarendon’, rather than a number. It was stock-broker’s Tudor style: solid wooded doors with latches rather than door handles and a big garden. The last time I saw the house was in 1963 when my brothers and I were summoned from school to attend our grandfather’s funeral at Waldron church. Years later, when I visited Cross-in-Hand again, Clarendon had vanished. There was no sign of it in the expected place and no one I asked seemed to have any memory of it. But recently (June 2018) there was a new development. Through the wonders of the internet, I was found by the son of Phyllis Greenfield. Phyllis, now 90, had looked after me in Cross-in-Hand when I was 2 and she was 14. Of course, I have no recollection of this. Hearing of my failure to find Clarendon, Phyllis and her daughter went to Cross-in-Hand and identified the house, which is no longer called Clarendon. This made me wonder about the other houses I had lived in as a child. The wonder of the internet is that I didn’t to leave my desk. I could look them up on Google maps. After my father return from the war he began his career as a schoolmaster. We moved to Hampstead where he taught classics and music at UCS. We lived in Tanza Road near the top of Hampstead hill. The house is still there looking much the same: A big house divided into three flats. We occupied the main two floors, an arrangement very similar to how I live today. 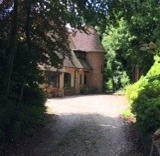 On Google street-view you can just see the door in the back wall of the garden that opened onto the heath. When I was 12 we moved to Richmond, in North Yorkshire, where my father became headmaster of the ancient Grammar School. Our house was part of the school. 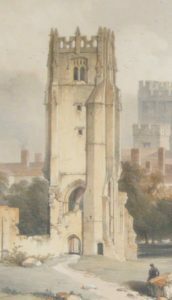 The most exciting feature was the Friary Tower, which, at that time, was in our garden, rather than in the park next door. This was for safety reasons so that the public would not have access to the tower. As a small boy, I could squeeze under the door and climb the steps to the wooden internal bridge that crossed to the other side. The other exciting feature of the garden was the bottom half of a human skeleton that I found just beneath the soil. The tower is still there, but the school has moved and the site now houses the Friary Hospital. Richmond is small and remote and the family felt it would not be good for me, or my brothers, to attend the school at which our father was the headmaster. We went away to boarding school in Cambridge. Towards the end of my time at school my father became headmaster of the even more ancient Archbishop Holgate’s Grammar School in York. Once again, we were living in a house that was part of the school. It was in Lord Mayor’s Walk, just over the city wall from the Minster. Four years later this school moved to the outskirts of York and eventually became a comprehensive. The building in Lord Mayor’s Walk is now occupied by York St John’s University and is, no doubt, much changed. So, the only home remaining from my childhood is the one in Hampstead. Perhaps this is the kind of place I feel most at home: a suburb of a big city, full of pretentious intellectuals.